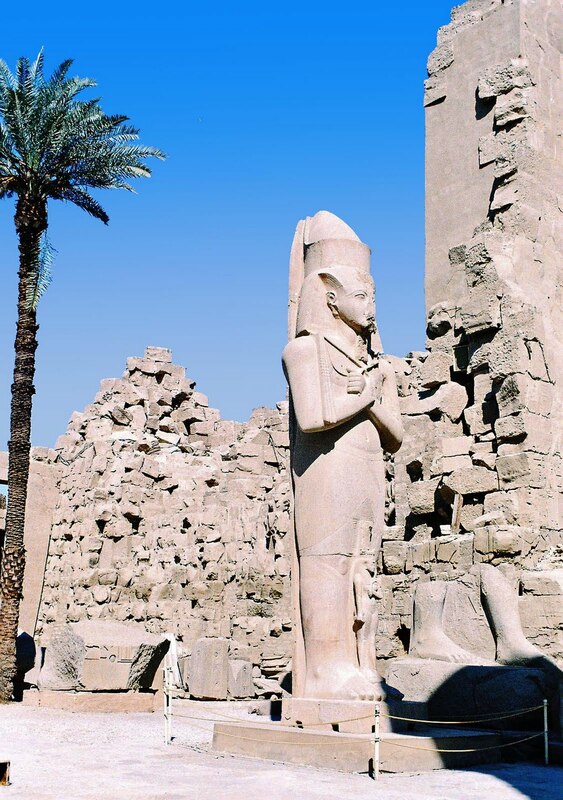 Here are some photographs of the impressive Karnak Temple Complex near Luxor in Egypt which contains several ruined temples, statues and buildings. 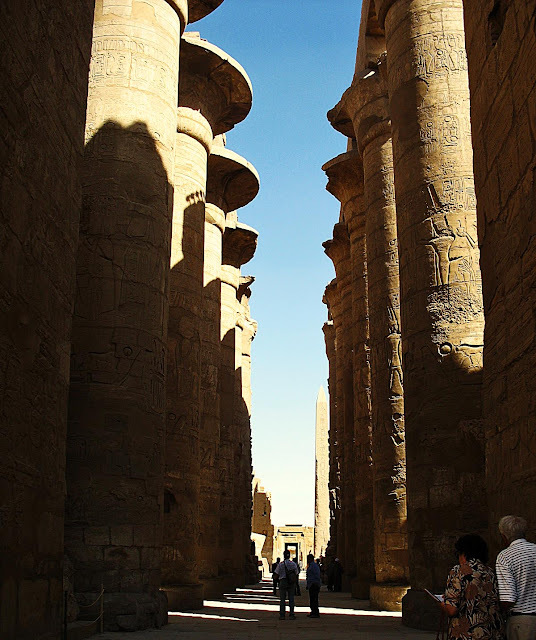 It is the largest ancient religious site in the world and said to be "the second most visited historical and archaeological site in Egypt, second only to the Giza Pyramids near Cairo". The architecture is typical of Ancient Egyptian architecture. It was built and used during the reigns of as many as thiry pharaohs and that is why there is so much diversity here. However only a small part of the temple complex is open to tourists as restoration work is still on. A reconstructed model of what the temples must have looked like can be seen here. 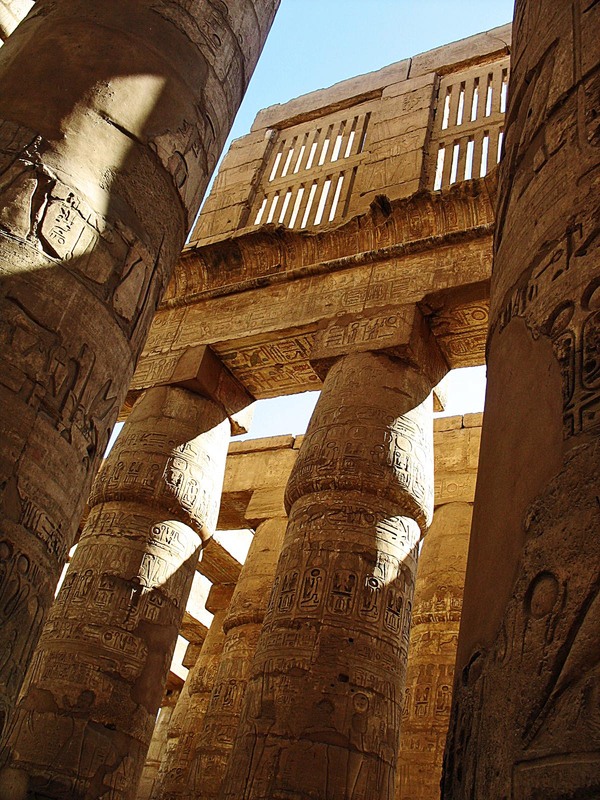 Here is a photo of the Hypostyle Hall in the temple of Amun-Re. The hall area is a massive 50,000 sq ft with 134 columns in 16 rows, most of the columns being 10 meters tall and with a diameter of over three meters. The beams on top of these columns are very heavy indeed (70 tons) and must have been lifted to these heights using levers or ramps. The roof is now gone. The roof once rested on these beams but now it is all open-air. 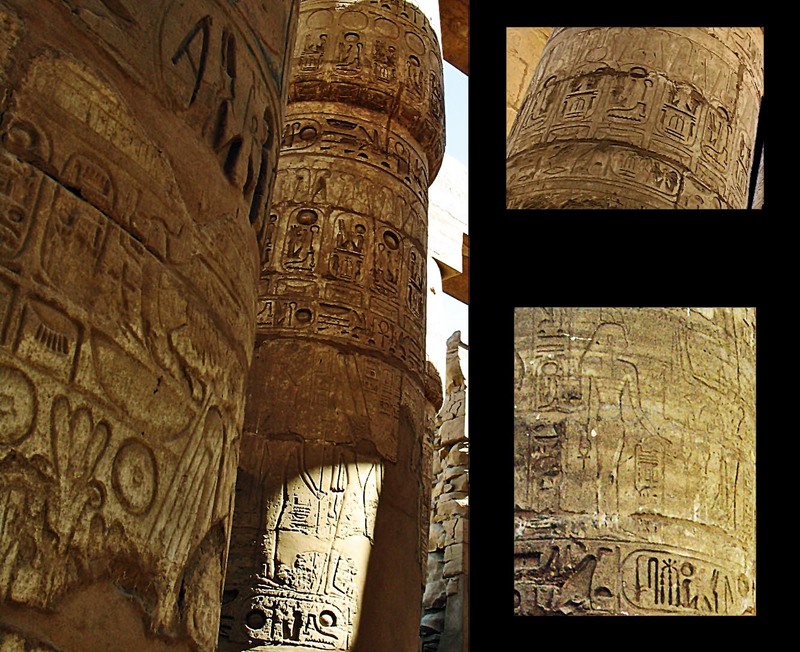 There are inscriptions on each of the columns and here are some close-ups of the inscriptions. The Ancient Egyptians left many writings in the form of pictures on the walls of tombs and pyramids, known as hieroglyphs. On the pillars you see hieroglyphs as well as drawings of figures. This is an Obelisk in the temple compound. 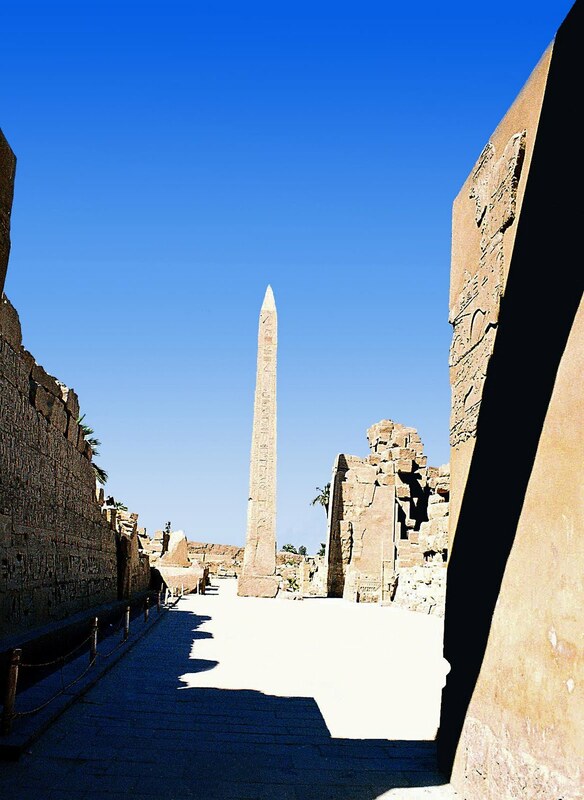 An Obelisk is a tall four-sided narrow tapering monument, often made at the entrances of temples. 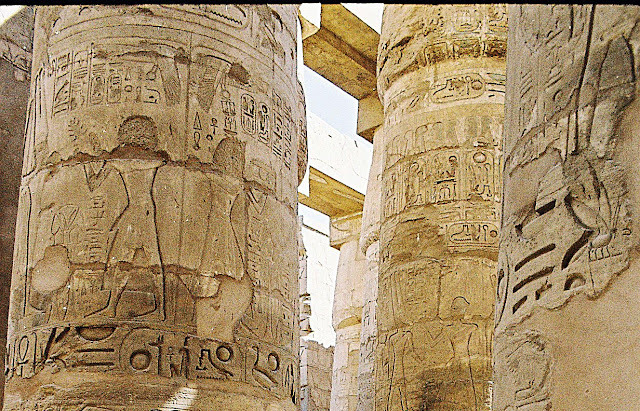 Below is a close-up of the inscriptions or hieroglyphs on the Obelisk. A statue of Ramses II in the temple complex. Many other statues lie in ruins. 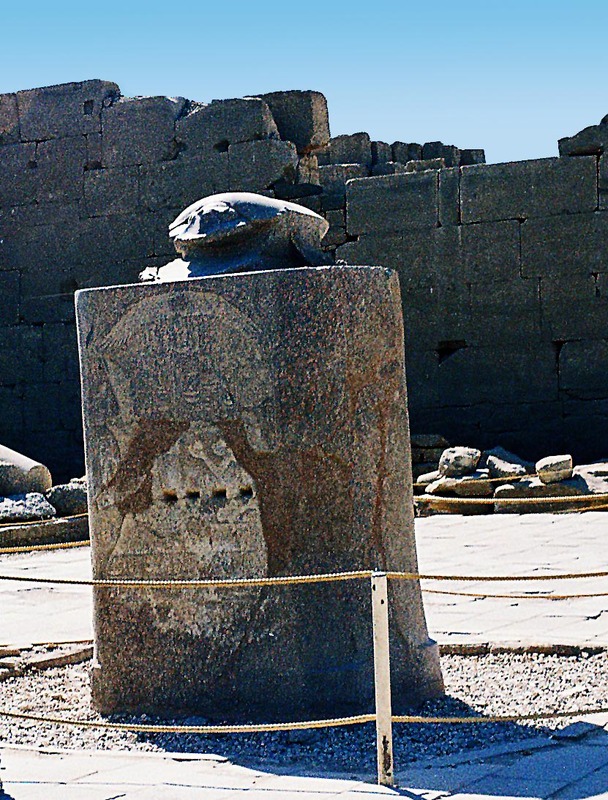 The scarab beetle is a symbol of regeneration and creation for the Egyptians and often found in temples. The beetle is often used in the design of artefacts and jewellery. If you are looking for sculptures and art from different parts of the world, click the label "Art"